Now that summer is here, I’m sure you’ll be on the go every day, enjoying all that the season has to offer. But do you know what else will be busy, following you everywhere you go? Insects. I know you probably cringed at the thought of bugs biting you while you’re enjoying the outdoors, but it’s one of the few harsh realities of summer. If you go to your local pharmacy, you’ll be able to find the insect repellent aisle overwhelmingly stocked with a dazzling array of options to protect you from ravenous bugs. Some repellents claim they are waterproof while others claim they have exotic active ingredients that haven’t been tested and may contain high concentrations of allergens. Repellent companies are barely required to follow any rules at all, leaving us feeling weary and untrusting. 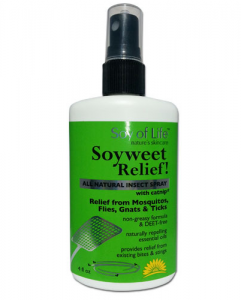 Unlike commercialized repellent companies you often see on store shelves, Soy of Life will be straightforward with you by sharing the key ingredients in their products, specifically their Soyweet Relief all natural insect spray. Soyweet Relief is a 100% natural, chemical-free and non-toxic product that uses naturally repelling ingredients from essential oils to stop insects from biting. Catnip oil, one of the essential oils we use, is said to be ten times more effective than DEET, the most common active ingredient in insect repellents. By taking nature’s finest insect deterrents and combing them with skin-loving botanicals, you’ll have softer skin, antiseptic and insect spray all in one product. If you have existing bug bites, the natural qualities in this product will help soothe the irritation, and the antiseptic properties can even help prevent infection. We are a premium and highly effective natural and organic skincare line designed to reveal a smoother, radiant and more youthful complexion. To keep the bugs at bay this summer, order your Soyweet Relief all natural insect spray now or call us today at 877-SOY-FOR-U to learn more.